Berry Panna Cotta — What the Fruitcake?! Panna Cotta, something I've seen umpteen times around foodie blogs and photo sites. Something I've read many a time is silky smooth and luxurious. Something that appears to be a lot of fun to make because of all the different flavours you can play with. Something I had never made or eaten until now. I really don't know why it's taken me this long to try this dessert, because I tell you, wow! It is now in my top five of favourite desserts. If faced with making the choice of having tiramisu or panna cotta the next time I'm out for a meal, I think I may actually have to flip a coin! The texture reminds me of creme caramel (one of the other desserts in my top five favourites) except a little more delicate. It's creamy and soft on the tongue but packs a punch of flavour. Give me more I say!!! I had a little of the cream mixture left over and had set it in its own cup, and I'm telling you, I could eat plain vanilla panna cotta by itself with no sauces or added flavours. Of course, I did add other flavours and sauces which was also delicious, but I really would be happy enough with a bucket of plain ol' vanilla panna cotta. Yes, a bucket. Right, I think you get the point. This dessert it magical. We were given a choice of making any flavour panna cotta we liked and my inspiration came from blue teaspoons. I was out with a friend for lunch at one of my favourite places (I <3 Avoca) and was perusing some of the sale items when I came across these gorgeous blue teaspoons. I just had to have them and so they found their way into my basket and out the door with me. Berries were an obvious choice, although I'm sure blue teaspoons would also look pretty good with many other colours like orange or green, I just wanted to go the berry route for this challenge seeing as frozen berries are plentiful which is always convenient. Of course, you can also use fresh berries if they're in season. I picked up a mix called Black Forest Berry Mix from Tesco (that's for any of you with a Tesco nearby) which is a mix of blackcurrents, blackberries, red grapes and black cherries. I wanted to do a few layers for the visual appeal, but just a friendly warning, it literally took me the whole of a Saturday to do this because of freezing and setting times, so if you want this for dinner that night, go with 2 layers, one of panna cotta and one of the berry purée. If you have time to spare, then go with the four layers, it really is eye-catching and the flavour develops overnight. Here's the (tweaked) challenge recipe with my additions for Forest Berry Panna Cotta, enjoy! 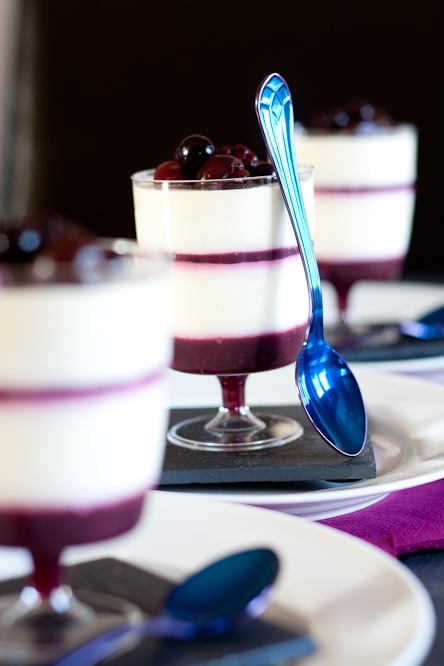 To serve, carefully place a few berries onto the top of each panna cotta and enjoy! Thank you to our host for the February challenge, you've got me hooked! 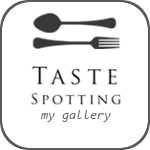 Click here to see the original challenge recipes. Whipping cream is also known as Single Cream, and around here in Ireland, it's simply called Fresh Cream. So make sure you don't use Double or Light Cream. I used glasses with a 200ml capacity and had a bit of the panna cotta mixture left over, so you could easily make these in slightly larger glasses. I use gelatine sheets because it's a better product than powdered gelatine, but if you can't find gelatine leaves, then you can use powdered gelatine. Use 1tsp of powdered gelatine for 1 sheet of platinum gelatine. Leave the powdered gelatine to bloom in a little bit of the milk used in the recipe. I was reading an article about panna cotta which suggested that the best way to set the gelatine in the cream mixture is to let it cool at room temperature so that it cools gradually, which will then help the gelatine set with a better texture, rather than cooling it rapidly in the fridge. Click here for the full article. Posted on February 28, 2011 by Mandy Mortimer and filed under Cooked, Daring Baker, Sweet and tagged berries blackberry blackcurrent cherry cream dessert egg free gluten free grapes milk panna cotta.